No one else is up, and I am sitting on the deck overlooking the lake. 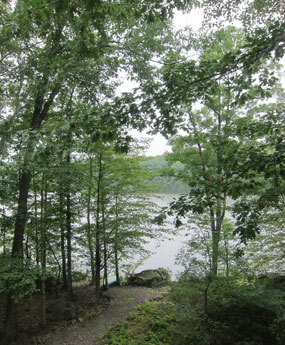 Scott and Betty purchased the best spot on the lake in this community in 1995 and built their “mountain house.” Best spot because their land is heavily wooded and juts out just enough so you do not see any other signs of civilization. When they visited this year for Old Home Days they said, “Ray, why don’t you come down to the Mountain House on Labor Day.” Without hesitation, I replied, “sounds great.” So here I am with Scott, Betty, and Rich, (Scott’s best friend since kindergarten) on a relaxed no agenda weekend plus. In case you got your maps out, I am close to where I-81 and I-80 intersect. And, if you forgot, Scott and Cathy worked together, and Betty and Cathy shopped together. Many years ago Cathy and I spent several days including New Year’s Eve here with them, but this is my first visit without snow. I left on Friday morning, later than planned since I fortunately had more than the usual number of book orders coming in during the night. Having grown up in Connecticut, and again living there from 1995 to 2002, I know all the ways to avoid NYC, and remember I have always been a shunpiker. Driving I-91 is usually a breeze until you get to Springfield, Massachusetts, except it was closed from Greenfield to below Deerfield, and the detour takes you down the old route 5. First travelled there in 1963 in my 1929 Model A Ford Roadster, and I still remember the pouring rain as I travelled through Deerfield Village – the sidecurtains were leaking – yes I was shunpiking even then. Back on I-91, I picked up the MassPike and headed west exiting at Exit 1 where I jogged over to NY Route 22 (always a favorite) and up in this countryside I had it absolutely to myself. I headed south to NY Route 23 to jog over to the Taconic State Parkway – another isolated favorite – and continued south to I-84 to again head west to Scranton, Pennsylvania. The advantage of going this way is to avoid even Hartford and Waterbury and Danbury on I-84 in Connecticut, and I pick up I-84 after it has turned north again before going due west – saved mileage and time, but remember, if you are “out for the ride” time does not really matter. I arrived about 4PM ahead of Scott and Betty, but Rich was happily at rest. 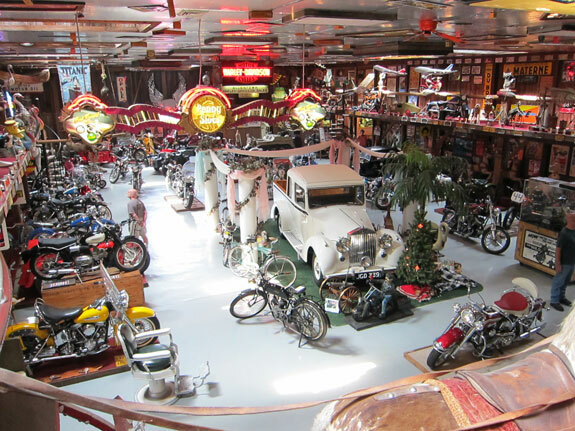 Everywhere you looked was another treasure, mainly with a motorcycle theme, but well organized thematically. 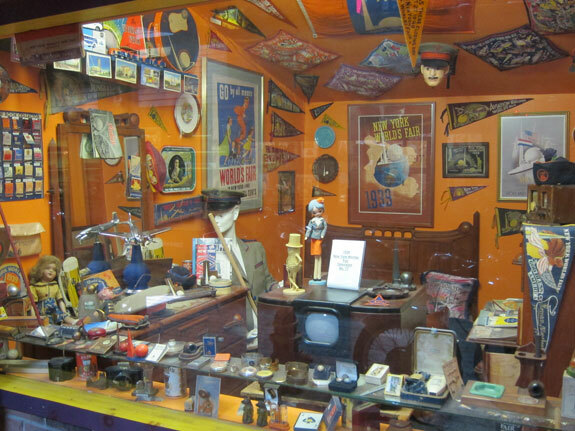 And what happens if you want to collect cameras, toys, Avon bottles, acquire a bar from the 1939 NY World’s Fair, shaving equipment, and on and on? 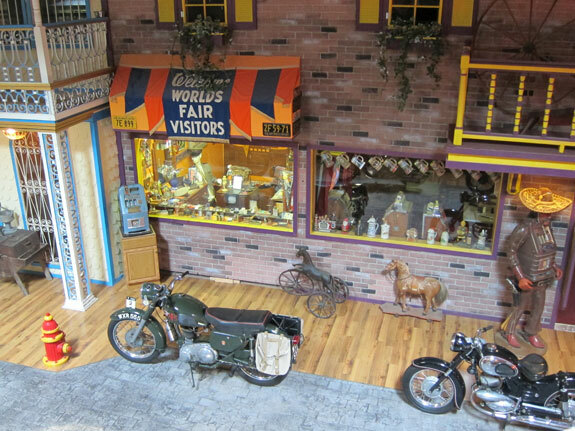 You simply add a wing, build a main street with different storefronts and display those collections in a store setting. It even works for a World’s Fair collection. Think I will just add a few images to give you a flavor. After 2 plus hours all our senses were overloaded. It was time to head back to relax some more. But not for long. Off Scott, Rich and I headed on the lake. Well, going out in a canoe and a kayak is still relaxing. 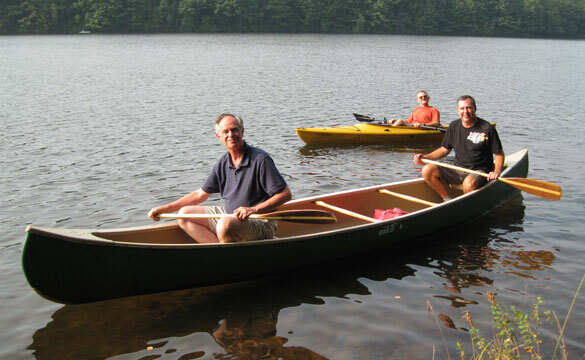 Scott and I were in the canoe, and Rich was in his kayak. At one point I looked over to talk with Rich, and said, “what is that attached in front of you?” Now, Rich has all the toys and he replied, “this is a GPS so I can track how far we travel.” Our elapsed paddling was 2.7 miles – I was disappointed that his readout was not in hundredths of a mile. What do you do after relaxing on the lake? Scott and his special brew. 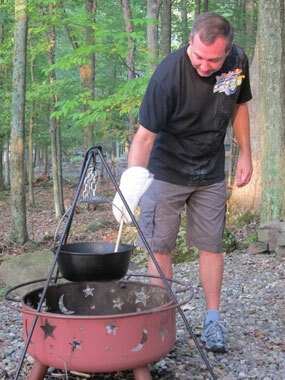 Well, it is time to relax in front of campfire and watch Scott work up his special batch of chili. Soon Tom and Ann arrived, Tom’s brother and his wife travelling back from Upper Michigan on their way home to Maryland stopped in, and soon it was 1 AM. I started this tale many relaxing hours ago and it is now mid-afternoon. We enjoyed brunch, the sun is going in and out with occasional rain-drops, but what does it matter. Scott just happens to have a device called an “air-card” that plugs into his computer giving us access to the internet (thanks Microsoft), so I did get a chance to check emails, and soon I will transfer this “blog” and my images to his computer to go on-line and do a posting. The fun thing, no plans for the rest of today and tomorrow, but I do have three books with me. 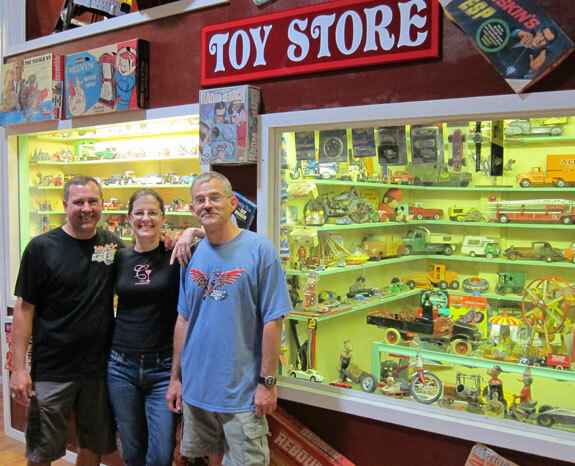 Rich and Betty just started playing Parchessi, and Scott is working with his 300 images he took at Indianapolis last weekend while he and Rich were there for the motorcycle races (Rich develops the fuels for NASCAR and racing bikes). On Tuesday when I leave I came up with the idea of stopping at STEAMTOWN that Scranton stole from us. I have never been, and this will be the perfect opportunity to stop. I will then follow my route back up through New York State, cut over to Great Barrington, Massachusetts to favorite shops there, and my timing should be just perfect to have dinner at The Red Lion Inn. Yes, I even put a sport coat in the van so I could dress as I want for dinner. This entry was posted in Day (or maybe two) Trips. Bookmark the permalink. I should have known Ray was out having a good time. Hearing all of the bad things going on in Vermont I worried if you had power. Called yesterday, but no answer..no machine either. The gypsy Ray was out having fun. 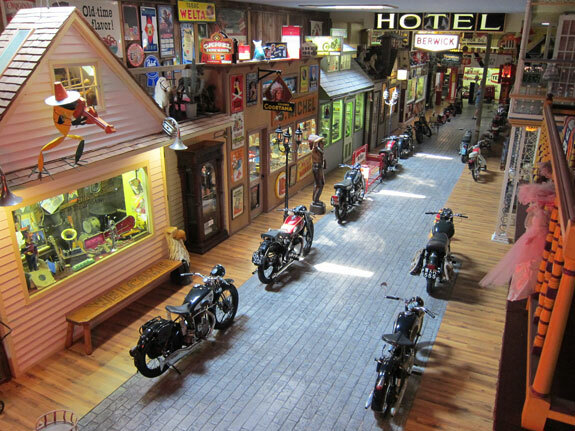 -:) Sounds like you are all having a great time and what a neat place like Bill’s Bike Barn to wander through. The lake is absolutely gorgeous and glad you got in the exercise. -:) Keep having a great time and drive home safely. Ray – are you off again on another adventure? There’s just no keeping you down my friend! I don’t think I saw that you are bringing one of those plastic dinosaurs home. Am I right? You did have me worried for a minute!